One of the greatest features on STM32F4xx for me was to get ethernet to work properly as server and client. I got it working pretty quickly and I was investigating how to make a library to be very useful and easy to use. Ethernet library is built on LwIP TCP/IP stack version 1.4.1. Library is pretty hard to “install” for first time, so I decided to provide you source files (on my Github) for Keil uVision and Coocox. Examples for Keil uVision and Coocox are finally available on my Github. Ethernet works with ETH peripheral. For this purpose, you can’t use any STM32F4xx device (F401, F405, F411, F415 don’t have ethernet). As of version 1.1, MII or RMII connection is supported. In table below is RMII pinout with 2 possible pinspacks. Look a little bit below to see table for MII connection. Example works without problems on STM32F4-Discovery with pinspack1. To get it working on STM32F429-Discovery, you must “damage” your board. You must remove gyro and so on. Not nice to try it there. I have 2 boards F429, so I take apart one to get it working. PA8 HAVE to be declared as MCO alternate function, even if not used for ethernet, or ETHERNET will not work. So keep in mind that if you don’t use this pin for ethernet source clock you shouldn’t connect anything to this pin. Library was built in using DP83848 Ethernet PHY. I have 2 DP modules for testing on both discovery boards at the same time and works well on both. You can get DP83848 module here. PHY is connected to STM using RMII mode. Basically, every PHY should work with this configuration because they have standard registers locations inside. Of course, every PHY has something different but they should work from start. I also have some functions for ethernet PHYs, which can be used for set custom pinouts, which will overwrite default pinouts and function for setting custom PHY settings. In example below, LEDs configuration in DP83848 will be changed. * Called when ethernet peripheral is ready. * In this function, user can do other stuff, depending on PHY which is used in project. * In this function, user can initialize custom pins, which will be used for communication with PHY. In common I will set things which HAVE to be used, no matter which configuration you use. One of them is Initialize function, which is used to initialize LwIP TCP/IP stack and prepare Ethernet PHY in working state. * Initialize ethernet device and prepare device to work. * function which enables server functionality in case you need it. * MAC address, instead of one in in defines. * Pointer to 4 bytes long array, if you want to select custom gateway. * Result enumeration used in ethernet library. To be able to get ethernet properly in working state, you also have several functions which HAVE TO be called. * This function should be called periodically, as fast as possible. * Number of milliseconds, that will be added to LwIP stack. Both function must be called periodically. Time update must be called in specific time. According to periodic time you call it, you have parameter for millis. If you call this function every 10ms, then pass into function parameter “10” which will increase local time for 10ms. Update function should be called as fast as possible. It’s not necessary to call it at specific time intervals. * This function can be used to test if you are ready to work as server or client. Each device in your network has own MAC address and IP address, default gateway and netmask address. My library allows you to set “dynamic” or “static” MAC address and IP. DHCP is a great protocol, which can be used to assign device IP from your router. This basically means, that you (STM device) sends packet to router with “I want IP address” and then router sends you IP address and question “Is this IP OK?”. If it is OK, STM returns “Ok” and IP is assigned. One feature, you can use with DHCP, is that when you request a IP with DHCP, then you are displayed in control panel of your router. You can see device name and it’s IP and MAC address. /* Device name which will be seen in router when requesting IP via DHCP */ #define ETHERNET_HOSTNAME_DHCP "F4-Discovery"
DHCP is also a part of my callback functions. If DHCP is enabled, when it will start with IP assignment, callback will be called. * This function is called when DHCP starts with IP address assigning for device. DHCP makes 4 tries to get IP. If it fails, or not, a IP is set callback is called, which can be defined by user. * This function is called when IP is assigned to device. * It is called in case DHCP is used or static ip is used. * It can be used to store IP address, if you use DHCP dynamic IP address. Another great feature in my lib is DNS. Domain Name Server allows you to get IP address from given doman name. For example, if you want to get IP address for “stm32f4-discovery.net” domain, you call DNS function and packet will be sent to DNS servers, with IP response (84.255.255.84). * This function can be used to get IP address by passing it's domain name to it. * Different DNS callback functions will be called, depending on what will happen with DNS. * Domain name for which you need IP address. * This function will be called when DNS server has valid IP address for your domain request. * It can be useful to make first connection in this function when you know your IP address where you must connect to. * This function will be called when DNS error occured. Client mode is one of 2 main features of ethernet. With client mode, you can request and receive data from another server, for example, you can make “data logger” which will make GET request method to another server where you want to collect and store your data. So when you are ready (IP is set) you can start with connection to another server at desired IP and port. Library allows you to make 4 connections at the same time. So you can call Connect function 4 times before any connection is closed. * Make TCP CLIENT Connection to external server. * After this call, different client callbacks will be called depending on what will happen. * Pointer to user data to be passed to this function. * Use NULL in case you don't want to pass any data. Function will start a TCP connection to specific IP address and PORT. Remember, this function must return TM_ETHERNET_Result_Ok which means that function succedded. In case it returns anything else, connect won’t work. Another thing here are client callbacks. Because connecting to some server may take a while, but STM is too fast for waiting callbacks are used here. I’ve made several callbacks. Here are just defines, how to use it you will see on examples. * This function is called when connection is prepared to send some headers data to server which is waiting for response. * If function is not implemented, then default headers are sent. * Pointer to TM_TCPCLIENT_t which contains current connection specifications. * Function must return number of characters written in buffer. * If you return 0 (zero) then connection will be closed. * This function is called when we have data available to be received. * It might happen that it will be called multiple times for one request, depends on server's response and length of data. * Pointer to TM_TCPCLIENT_t which contanins current connection's specifications. * This function is called when device is connected to specific server. * This function is called when connection is closed and you are ready to make a new one. * You can also detect, if connection was closed after success or error. * This function is called when an error occured. * This is user defined option. * When you connect to some website and receive data back, you will also get HTTP headers and your data. * When receive data handler will be first called, this parameter will be set to 0. * and it will stay 1 until connection is closed. This can be used, if you don't want to print headers to user. * Pointer to number of active connections this time. * to format proper request string. Server mode is a little bit difficult for explain it’s configuration, but I will try to be clear. First, when you initialize library, server is disabled. Because, you don’t want that someone just come to your device if you don’t want. if you want to use server mode, then you have to enable it and tell on which PORT you will use your server. * Enable and prepare LwIP stack for server functionality. * Select your port on which you want to operate. * Disable and stop LwIP stack from server functionality. Enable function is a little bit weird I would say. So only first time parameter will work. It means, that if you call this function multiple times, PORT will be used the one, which was used on first function call. Future calls don’t have affect of this parameter. Ok, our server is enabled, and is accessible on our local IP. You can get local IP address using TM_ETHERNET_GetLocalIP function. But, it has no effect, if we don’t show anything to user. In file fsdata.c are 3 files, which are displayed to user in case you don’t make your own. They are just for demonstration and I suggest you to remove them, or at least short data to minimum to free memory in flash. * here you can open file and do the stuff. * Note: You must set file->len parameter to your file size number! * that will say "Hello world from default server file", stored in fsdata.c. * you can mount it in this function also. * Called when reading file is finished and file can be closed. * If you need to unmount your SD card, you can do it here. * Called when file should be read. * This function may be called more than just one time, depends on file length. * Number of data that should be read. * You can read less than this number. This is max number you can read this time. * Returns number of read data, or -1 (EOF) if file has end. In the examples below, you will see how to implement server with FatFs library from Chan. Which file should be opened will LwIP tell to you, you just have to make sure that you open file (if existing) that is in parameter. * This function can be used, to block IP address. * or 0 if you want to deny access to your web. * Check if server mode is enabled. Our server works, web site is displayed to user. How to display useful data to user? How to control device over ethernet? Let’s say, that you have website and when user access to your server, you want to display current temperature to him. You will have to assign new SSI tag and pass it into SetSSITags function, which will be described below. Then, in your HTML code, you need to add SSI tag also, which will then be replaced by LwIP to useful data. For example, you define SSI tag in your code, named “temperature“. Important is part in bold text. Other is just normal HTML which you wanna use. Now, you have tags defines and place into code. Next step is to set some data when this tag is found by LwIP in code. When SSI tag should be placed into code, my function for SSI will be called. This is fixed name function and is only one function for all SSI tags in your code. * Set SSI tags, which will be used in your HTML files for displaying variables on website. * Note: SSI tags only work if your file name ends with .shtm, .shtml, or .ssi! * This function can be called only once, future calls will be denied! 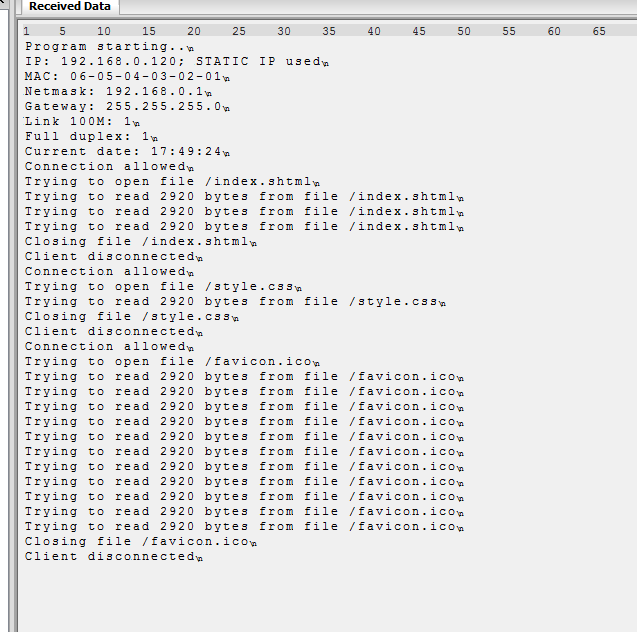 * This function is called, when ethernet server wants to serve tag you pass in TM_ETHERNETSERVER_SetSSITags() function. * Must return number of characters in your pcInsert pointer. In examples below, you will see how to use tags in practise. You can use more than just one CGI handler. CGI handler is called when you access to a URL which ends with .cgi. In our case we have “my_url.cgi” and let’s assign function which will be called on CGI call. My library can also handle POST requests but I don’t suggest to use this. It is not 100% stable for now, and I will not describe how to use it yet. Here are described all functions and enumerations. It’s long part so they are hidden by default. * Pointer to HTTP request buffer. * Pointer to address (file address, "/index.html" for example) which will be used to show url to user. * for example, turn on/off leds. * Note: CGI tags only work if your file name ends with .cgi! * Pointer to TM_ETHERNET_CGI_t structure with link/function pair combination. * This function will be called when link is down. * This function will be called when link is up again. * then before new connection can be made, system MUST be restarted for security purposes. * Before you call NVIC_SystemReset() in function to reset system, you can do important stuff here. * This function is called, when POST request is trying to be started to our server. * After POST request finish, you have to choose one file, which will be used to displayed to user after successfull POST end. * If you don't set it by yourself, then "/index.html" file will be used. * In this structure are also other variables, which one, you should look at TM_ETHERNETPOST_t struct declaration. * Pointer to TM_ETHERNETPOST_t structure which contains everything about POST connection. * Look for TM_ETHERNETPOST_t struct comments what you can use in this function. * This function must return 1 in case you want to accept POST request, or return 0 in case you want to deny it. * In params structure you have also HTTP headers, so you can look at them and deny access in some cases. * This function is called, when we have "Content-Length" statement. * Function might be called multiple times, depends on how many data you try to sent over POST method. * Data are stored inside p->payload variable pointer, which is void pointer. Make a cast to char* variable. * In pbuf struct is also length of this packet, so you have a little control about that. * To know when you have last time called this function, you can make a compare of params variables. * Pointer to pbuf structure where data are stored. * This function must return 1 if you want to receive more data, or return 0 in case you want to stop POST request at some time. * This function is called when POST request is done. * This function must set response_uri variable to set response URL, which will be used to show to user. * If you don't set it, then default will be used. STM configured as server mode on port 80. For debug purpose is used PC6 (USART6) @ 115200baud where you will be able to see initialization settings. * Keil project template for ethernet server.